Why did they go back? 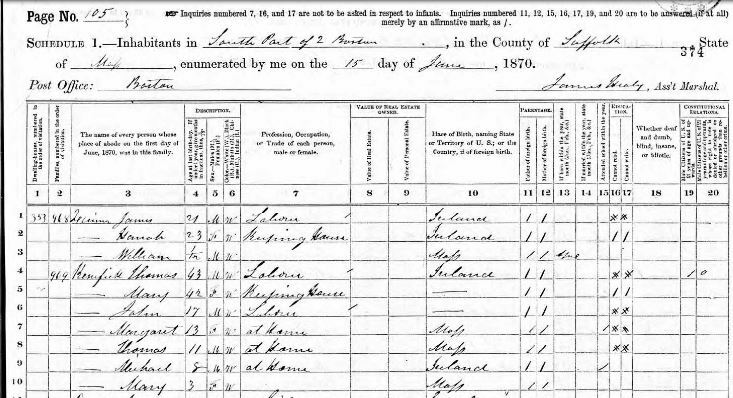 The Keneficks in the 1870 Federal Census. My great-great-grandmother, Margaret Kenefick, was born in Boston on 11 February 1857, the daughter of Irish immigrants Thomas and Mary Kenefick. When I began searching for the family in Boston, I turned to the 1860 Census, but was surprised when I could not locate the Keneficks in Massachusetts. Whenever I cannot locate someone in a census record, my next step is to turn to city directories, when available. In the 1857 Boston City Directory, I was able to find Thomas Kenefick, laborer, living at 433 Commercial Street, the same address found on the birth record of Margaret Kenefick. However, Thomas Kenefick disappeared from the city directories after 1857. Fortunately, the family is listed in the 1870 Census, living in Ward 2 of Boston. Thomas and Mary Kenefick have five children: John, Margaret, Thomas, Michael, and Mary. What caught my attention were the birthplaces listed for the Kenefick children. While Margaret, Thomas, and Mary list their birthplace as Massachusetts, John (age 17) and Michael (age 8) are listed as having been born in Ireland. As John is the oldest, it was unsurprising that he might have been born in Ireland, and then emigrated with his parents; however, Michael is one of the younger children. Was Michael’s birth information incorrect, or does the disappearance of the Kenefick family from census records and city directories indicate that they returned to Ireland for a time? According to the death certificate of Margaret (Kenefick) Muir, her parents were Thomas Kenefick and Mary Woods. 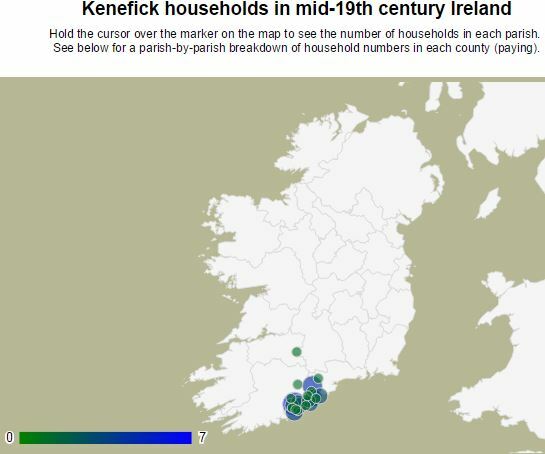 Kenefick is not a common surname; in the nineteenth century, it is almost exclusively found in County Cork. Many of the County Cork church records have been digitized at Irish Genealogy, where I located a marriage record between Thomas Kenefick and Mary Woods dated 13 April 1852 at Tracton Abbey, Kinelea, County Cork. Searching the baptism records for the area, I came across a baptism record for a John Kenefick, son of Thomas Kenefick and Mary Woods, baptized 14 April 1853 at Cork South Parish. I also found baptism records for Thomas Kenefick, dated 23 April 1859, as well as a Michael Kenefick, baptized 18 July 1862. Thomas and Michael Kenefick are both listed as the sons of Thomas Kenefick and Mary Woods. Baptismal record for Michael Kenefick at St. Finbar’s Church, South Cork. 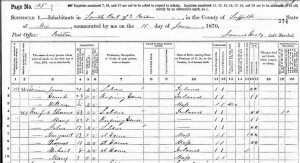 The baptism dates for John, Thomas, and Michael Kenefick line up with the ages of the children of my Thomas and Mary (Woods) Kenefick, who are in Boston by 1870. These are also the only children born to a Thomas Kenefick and Mary Woods in County Cork, which leads me to believe that this is the same couple found in Boston in 1857 and 1870. But why would Thomas and Mary go back to Ireland? I found it interesting that Michael Kenefick was baptized at St. Finbar Church in the city of Cork, rather than in Tracton Abbey where his parents were married. Perhaps Thomas Kenefick took his family back to Ireland for economic reasons; according to a Kenefick family website, there was a Kenifeck family (alternate spelling) who were woolen drapers in the city of Cork throughout the eighteenth and nineteenth centuries. Though the potato famine had devastated much of Ireland, I briefly looked into the economic history of the City of Cork to see if the area had perhaps bounced back more quickly than the rest of the country. The History of Cork provides a great deal of insight into the history of Cork throughout the Potato Famine and its aftermath. In the latter part of the nineteenth century, it appears that the city tried to revitalize its economy, but was largely unsuccessful due to competition from foreign markets. Therefore, it seems unlikely that Thomas Kenefick and his family would have returned to Ireland for economic opportunities. 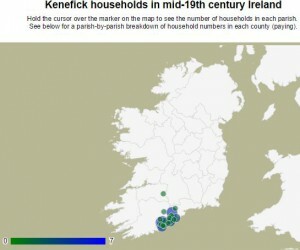 Perhaps family circumstances brought the Keneficks back to Ireland. My next step is to look at Irish Calendars of Wills and Administrations, 1858-1920, available on FamilySearch.org, and Irish Petty Sessions Court Registers, 1928-1912, available at Find My Past, for references to the Kenefick and Woods families in Cork that may explain why the family needed to return to Ireland. A different version of that question is one I have for practically all my great grandparents: why did they leave home and make the arduous journey to this country. I can find details like the name of the ship they sailed on, where they lived and when they died, but wish I could find the “why” of any of it. Nancy, that is exactly the question I have. So many migrated at about the same time (even after settling, there were more migrations, all at about the same time). I have started to really focus on the histories of the places and time periods, and what the factors might have been that drove these migrations. This has been invaluable in shedding light on my ancestors’ lives, even when the books said nothing about them directly. (Though recently, I found an excellent scholarly history about Grandby/Simsbury, CT that to my delight, named a couple of my ancestors, with citations that will cut short my search for information!). Searching wills and estates is a good idea, especially if you have the name of Thomas’ father or other relatives of an earlier generation. It was not unknown for families to return to the old country to settle the affairs of deceased members of their family, particularly if the amounts to be inherited were significant. I spent last week visiting Tracton Abbey parish in search of important sites and landmarks in my own family history, including Ballindeasig House which was owned by the Kenefick/Kenifeck family. My Hanlon ancestors were tenant farmers there whose landlord during the 19th century was the Kenefick family before the Keneficks there went bankrupt. Saw several Kenefick gravestones in my travels. Do you know any earlier generations? I am related to a Thomas Kenefick, a great grandfather, who lived in Gold Hill, Storey County, Nevada in 1880. He was working in the mines probably in this area around Virginia City and the Comstock Lode. According to census he was born in Ireland in 1833 and married a Mary A. Collins. I have also seen family notes that mentions him as John, they had 8 children. He may have arrived in U.S. In 1852. Family lore says “Mary Collins was a school teacher in a Catholic Convent and met John Kenefick on ship coming to America. Both from Ireland. John was a silver miner. They settled in Gold Hill, NV. All of their children were born there.” Not sure where the family went after NV. One of his children, Mary, was married in Butte, montana. My grandmother, Jane, gave birth to my dad in Stockton, CA. What do you think? Connected? Were they deported? There was a lot of anti-Irish sentiment in Boston then. I suspect that Thomas Kenefick was related (a brother, perhaps) to James Kenefick, my GG grandfather. James and his wife Mary McAuliffe (or McCullough) also hailed from Cork and emigrated to Boston, living at one point at 33 Sergeants Court and that James worked for Edison Electric in Lynn, Mass; and 454 Boston St in Lynn. I know seven of their 11 children were born in Ireland (only one of that seven was a male—James Augustus, born in 1869). All seven of those were baptized at St. Finbar I assume, four additional children were born in the U.S. The census document for 1890 shows Mary and James living at the Boston St. address, same with the 1900 census which establishes they were living with a nephew, Denis Kenefick, who had emigrated the previous year. Inexplicably, on the passenger manifest, Denis declared that he intended to live with his uncle at 6 Keating St, don’t really know who that might have been. Family lore says that James & Mary, or just James, may have returned to Ireland for a time, probably to find work. The parish registry of Carrigaline (sp) is digitized on line & provided me with a great deal of information and more abundant questions. For example—why were there only 8 to 10 given names for male offspring—John, James, Michael, Patrick and Liam over and over again for generations? Females were often Mary, Honora, Ellen, Anna and Elizabeth. This paucity of first names makes it very confusing to try to follow a line. There were lots of Keneficks (and variations of spellings) found in the Carigaline registry, back to the 18th Century. They were generally paired up with such names as Daly, Daily, Sullivan, Kelly, McAulliffe, and so on. I didn’t intend to run on like this, but this is the first inkling I have had that Thomas and James may be close kin. Thanks for your efforts. I found your post searching for William Kennefick married to a Mary surname unknown. Their daughter, Elizabeth, ended up in the Midleton Workhouse in 1849 and was one of 25 orphan girls from there who emigrated to Australia onboard the John Knox under the Earl Grey Scheme. I am researching these girls and seeing how their paths diverged after they arrived in Australia. I am doing a geneology for each other girls, but not unsurprisingly the Irish side of things is difficult. I was wondering whether your Thomas was a brother of this Elizabeth. •	Other : Shipping: house servant, cannot read or write, no relatives in the colony; lived with Moses Sykes who was already married but she did marry him in 1886 in Orange, the year he died. She remarried after his death. Descendant Mrs Maidee Smith, 44 Carpenter Terrace, Australind WA 6233. Also, I thought you might find a series of novels by Brendan Graham of interest. It moves from Famine ravaged Ireland to Australia, Boston, back to Ireland and back to Boston. Brendan Graham wrote the iconic song: “You Raise Me Up”. He has packed so much info into these novels and they’re beautifully written. Highly recommended.